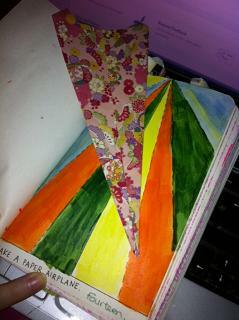 Quick post with added Wreck This Journal. | An alien voice under a duvet of dreams. 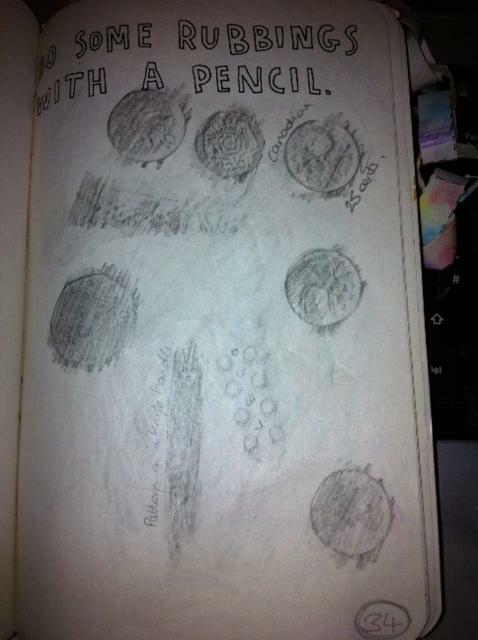 Posted by phoenixaeon in A330, Art, Mythology, OU, TMA03, TMA04, WTJ. Argh! It feels like ages since I’ve popped my head around the blogging door, well, I suppose it has been really, so thought I best binary scrawl a post quick sharp. First things first. I would like the thank the lovely xlalalalisax (plooberific award) and kofegeek (liebster blog award) for fabulous blog awards. Thank you both! The mark for the last essay (TMA03) came back about a week and a half ago. Yeah, I know. I shouldn’t have been so worried about it. Needless to say, I was distinctly happy with it. And quite shocked, because I really didn’t feel that I had taken in much of what I’d read. So, yay me! Two more essays and the big examinable essay left to go, then I’ll be onto the last course of the degree. Can’t believe I’ve been so stubborn to have stuck it out! OK, I know I’ve still got a ways to go, but still. Don’t know what I’m going to do to fill my time when it’s all over. Well. 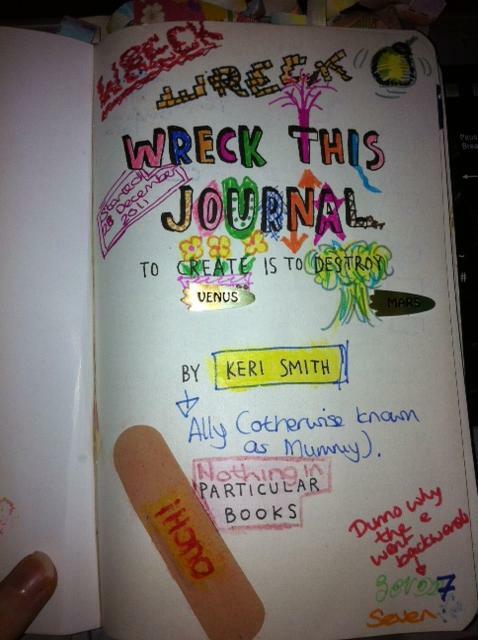 Wreck This Journal time. I’ve not done much, so most of these pages are ones I’d completed a while ago and not posted yet. And one is a half-arsed attempt. But I’ll let you decide which one that might have been. The frontis page. Liked getting the Mars and Venus stickers in here, considering the Greek and Roman mythology course I'm doing right now. The copyright and dedication page. 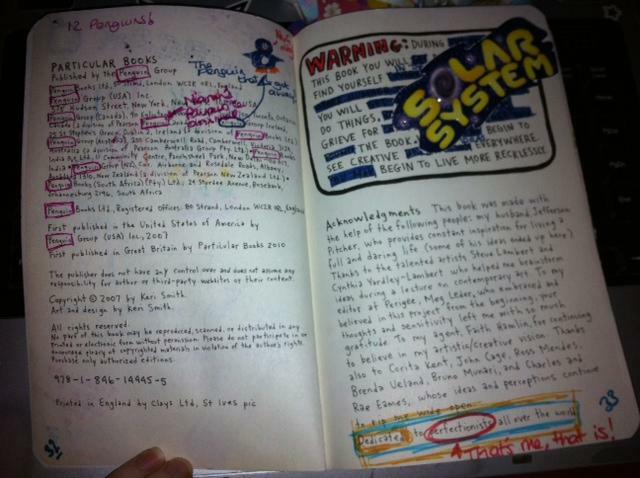 Penguins for Princi, and the 'Warning' now reads: During this book you will find yourself in the solar system. You will do things. Grieve for the book. Begin to see creative ideas everywhere. Begin to live more recklessly. Make a paper plane. Plane made with kimono-patterened origami paper. I was going to put a decoupage Snoopy on his Sopwith Camel kennel on the painted part, but haven't gotten around to it yet. And that’s that. Now to get back to Mr Ovid and his Metamorphoses and the evilness that is the two-part essay. Part 1: comparing the Venus and Adonis story to Titian’s ‘Poesie’ painting. Part 2: It’s spiders and frogs and birds, oh my. And spinning a yarn about transitions between stories and how Book 6 is constructed into a unified narrative. So it’s off to the loom to spin the critical fleece and weave my own fictional tapestry of an essay.